Artwork by: Intermedio, Sean Mullaney, Karen Saunders, Team B w/Ingrid Schmidt and Rob Wolpert. 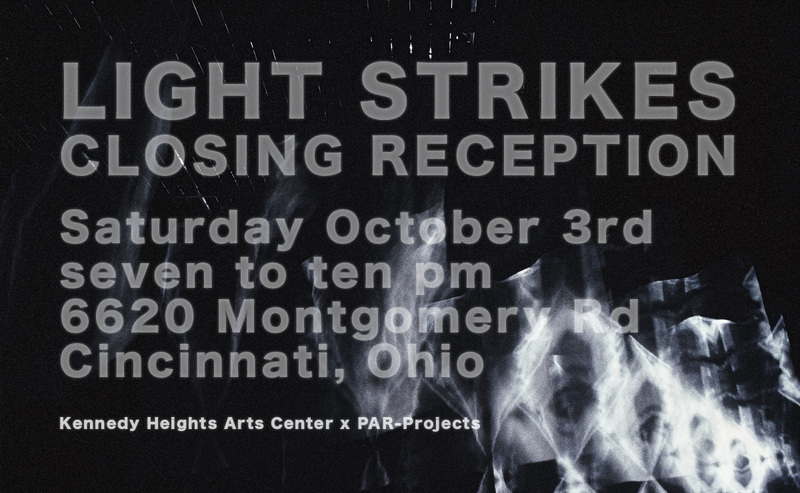 To celebrate the opening of the new Kennedy Heights Cultural Campus, Kennedy Heights Arts Center and PAR-Projects have teamed up to present Light Strikes, a breath-taking exhibition of installations curated by Jonathan Sears. This exhibition -- presented in a 9,000 square foot empty unit at the Kennedy Heights Cultural Campus, 6620 Montgomery Rd. -- evolves around the theme of light. The five large-scale works that fill the space seek to promote discovery and interaction, as they transform the space into a fully immersive experience. Intermedio -- a Cincinnati-based artist collective made up of Eric Blyth, Sam Ferris-Morris, and Justin West -- offers interactive work for the exhibition. Pulling from their backgrounds in architecture, programming and music composition, patrons are invited to "play" with their work creating their own melodic tones. With every swing of each custom-made orb, soft echos of "bing" and "bong" fill the only candle-lit side of the entire space. Giving participants this much control allows for a full sensory experience. The lights swing as the candles flicker. The warm glass on your hands controls the audio around you. Creating under the auspice of "former toy maker," one common trend with the work of Sean Mullaney is an element of fun. This time around shadow play becomes the driving focus as light-cast organic shapes rotate on the floor and spin up and down the walls. Without having the sculpture that's creating these shapes in view, absolute confusion would more than likely arise; instead, enjoyment of form and movement are highlighted. Twirl with the forms or simply spectate; this larger-than life installation captures imaginations with its use of movement. Karen Saunders, resident of Pleasant Ridge -- a Kennedy Height adjacent neighborhood -- offers the most localized piece of the exhibition. Based on the history of the abandoned Kroger building -- which we now occupy as the Kennedy Heights Cultural Campus -- Karen's work speaks of organic growth and perseverance, with a touch of previously documented graffiti. 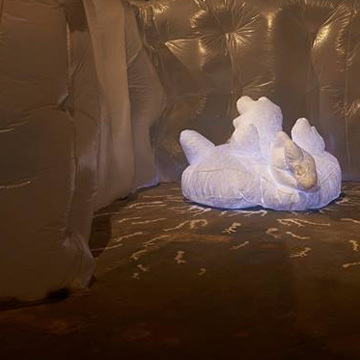 Through the use of two large scale, hand-stitched inflatable sculptures, viewers are encouraged to "enter" the low lit structure to gain a sense of creation. As the air fills the eight foot tall surrounding forms, thoughts of harmony and balance are suggested as viewers realize they are part of the conversation. 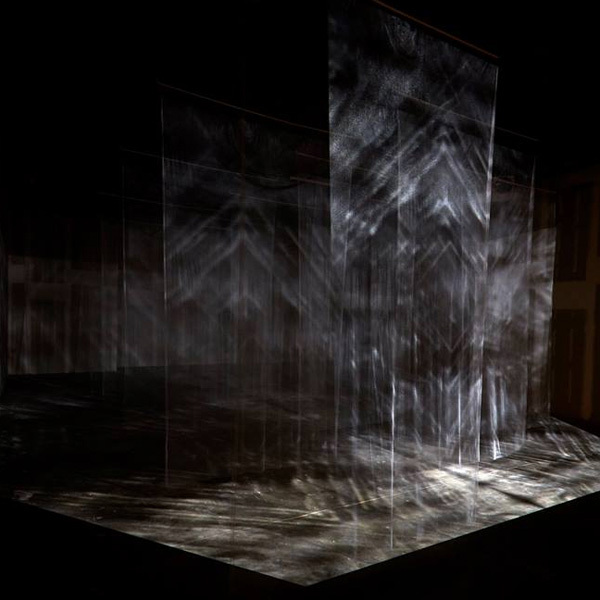 Ingrid Schmidt joins Team B (David Corns, Quinn Kummer, John Stoughton) from her graduate studies at Cranbrook to help create another interactive work for the show -- Liquid Sky. A hand-built, reflective, shimmering ceiling leads viewers to a mysterious form worth contemplating. Flashlights are used for exploration and the colors that surround participants are unlike most experiences found on a day-to-day-basis. 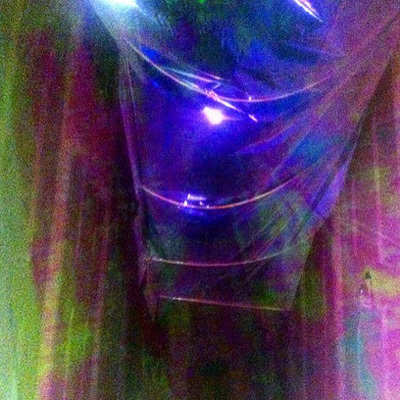 Imagine spelunking in a cave of rainbows and you'll find yourself nearing the sensation of this work by Team B. Rob offers the largest piece of the show. Approximately 18 feet tall x 40 feet wide and 30 feet deep, his multiple screen projection piece is well planned and mesmerizing at times. Shapes shift as his abstract animations fill the space, letting onlookers digest and interpret the story of the movements for themselves. Viewers are also encouraged to walk throughout his installation, transforming them into part of the canvas. 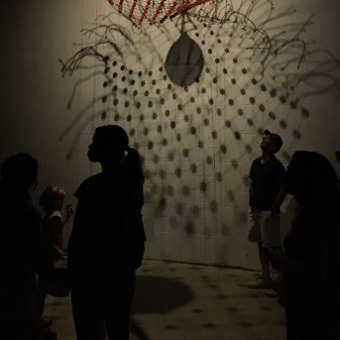 Patrons are also able to alter the shape of his suspended screens with gentle touch, helping them stay more engaged. More than most other things -- including the use of light -- it should be noted that this exhibition has a lot to do with call and response. Everything about this show was developed via a back-and-forth, so it was exciting to watch it come together. Back-and-forth interactions happened between the trusting building owners, our collaborators, and myself. 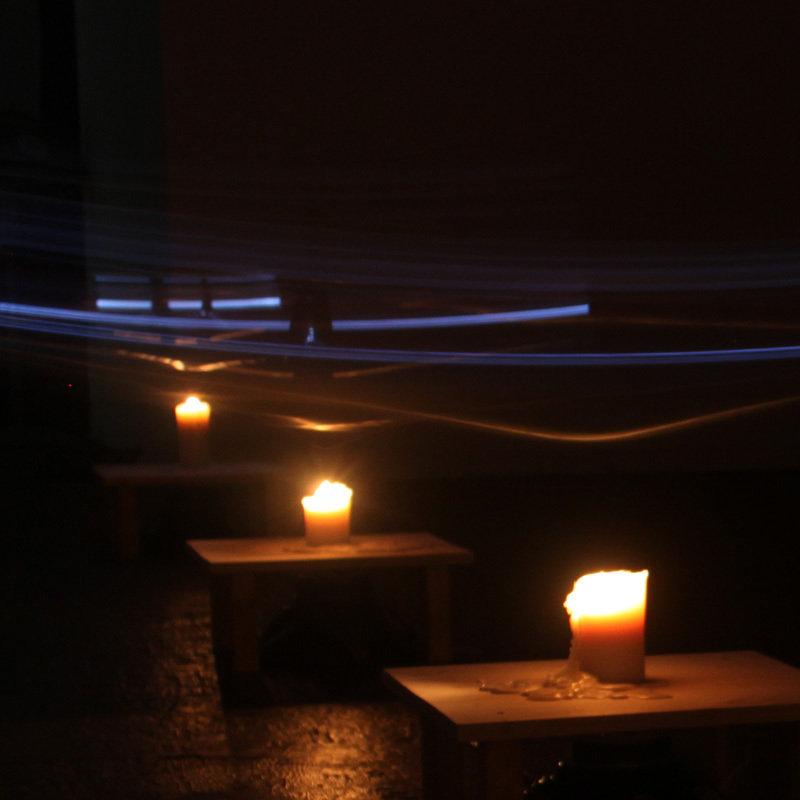 Back-and-forth interactions happened between the artists, the space and what could actually work for the exhibition. And when boiled down, everyone involved was called upon to step into the realm of the unknown and their unique responses have produced something we all are quite proud of. We've challenged ourselves to create something new here. From a curatorial standpoint, figuring out how to help the artwork shine in such an unfamiliar space was my biggest challenge. Imagine walking into a vast, 9,000 sq foot space -- which happened to be under construction at the time -- with only a few months to figure out how the space "worked," much less conceptualize a show and pull together the creative talent to make it all speak volumes. Still, the artists are who should be applauded. They were pushed. Of the five large-scale pieces that fill the space, only one had been shown before; but even that one was completely reworked and redesigned to fit this new environment we were placing it into. In other words, every piece of work created for this show was brand new. And for the most part, the participating artists were not only given an extremely tight deadline, they were asked to think much bigger than they were used to. Pieces had to be reworked on the fly as the were being installed. Pieces had to fill the space to keep the show cohesive -- the smallest piece is over seven feet tall. Essentially, when in the space, it feels as if the artists set out to impress themselves, so I hope their successful efforts are appreciated. Conceptually, there's not much to add. This remains a fairly straightforward, non-aggressive exhibition. It started with a simple question I asked myself and those involved: "How many ways can we 'play' with light on a large scale to create a cohesive & unique experience?" Pulling in a bit of interactivity was the first goal. Balancing the way each use of light helps viewers travel amongst the space was the second. We hope to see you at the closing reception on October 3rd, so you can see how it all came together.